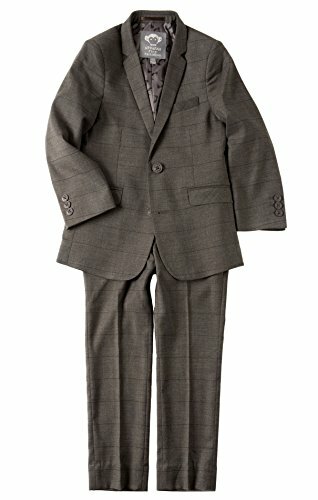 Appaman Kids' Size Chart Have your little one channel the chic days of yesteryear in the Appaman™ Kids Classic Mod Suit. Polyester-viscose blend two piece suit has a slim cut.Jacket: Slim notch lapel. Left chest besom pocket. Long sleeves with three-button close on cuffs. Double-button front closure. Seamed front flap pockets. Lined with brand logo fabric.Trouser: Belt loop waistband. Slash hand pockets. Back welt pockets with button closure. Zipper fly with button closure. 85% polyester, 15% rayon;Lining: 100% polyester. Dry clean only. Imported. Measurements: Length: 22 in Waist Measurement: 24 in Outseam: 28 in Inseam: 18 in Front Rise: 8 in Back Rise: 13 in Leg Opening: 12 in Product measurements were taken using size 10 Big Kids. Please note that measurements may vary by size. Have your little one channel the chic days of yesteryear in the Appaman™ Kids Classic Mod Suit.